Last edited by Strela; October 11th, 2006 at 13:52.
hands hands and more hands. 1. 1 x standard pointed central (non winged) sturmanskie chrono 3133 hand. Parts i have if anyone needs. 1. almost any 3133 part i had a complete movement that i stole the chrono wheel and fourth wheel from, so now it is all spares. 2. 31659 movement complete and running, needs regulation, i may keep it for a spare but i do have one. if you are in need of one ask maybe we can work something out. Last edited by watchwombat; October 11th, 2006 at 14:48.
central chrono, second and minute counter hands. Last edited by TZAG; January 22nd, 2007 at 18:38. 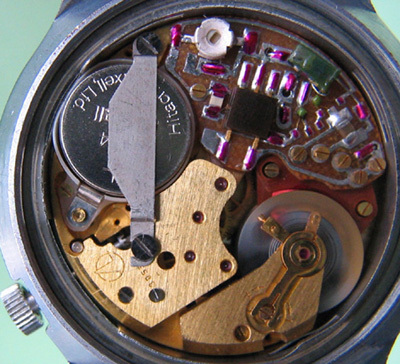 I need a 3017 calber (Strela) minute jumper or a parts watch or poor condition (cheap) watch with the needed part. The recommendation of Frank Spar was very good and he was friendly and professional; he serviced one Strela but could do nothing about the missing minute jumper on the other so its cannibalism or no chrono functions on my white dial paddle hand Strela.